While we all know that carrying too much weight inside your handbag can be detrimental to your posture and overall back health, it seems that for a long time now, the trends have simply not been favorable to those who suffer from back pain. In particular, the oversized handbags of the 1990s and 2000s seemed almost an invitation to muscle strain, and many women today are still paying the price for those hardware-laden (although admittedly beautiful) designer bags. However, if you count yourself among the number of people who suffer from back pain, all is not lost. Trend-wise, the last several seasons have indicated things are lightening-up once again with the emergence of smaller cross-body bags, backpacks, and waist bags. Still not sure if your back will allow you to carry a certain bag? Don’t worry. We’ve scoured the web and found the most back friendly bag designs out there so that you don’t have to use the trial and error method. Experts all agree that a backpack is still the best design for those who suffer from back pain, but that is only if it is worn properly. A backpack should be worn with both shoulders in the straps, and it if is heavy, it needs to have a waist belt to take the weight off of your shoulders. If you need something a bit more refined than a backpack, a cross-body bag with an adjustable thick or paddled strap is the way forward. This allows you to adjust the bag to fall right at the part of your body where the weight is the most balanced, yet the strap doesn’t cut into your shoulders. While leather bags are usually associated with high-end luxury brands, they tend to be heavier than their nylon or canvas counterparts, so if you’re looking to lighten your load, try one of the iconic all-weather coated canvas bags (suchlike Louis Vuitton) or one in an equally covetable nylon (like the ones of Prada). While there are no hard and fast rules within some of these recommended designs, it’s down to the wearer of the bag to understand his or her body’s’ needs, and be able to adjust the bag to maximum effect. That said, overall, it is recommended that you do not attempt to carry more than 15 percent of your body weight in your handbag. Gucci started Milan Fashion Week with a bang! 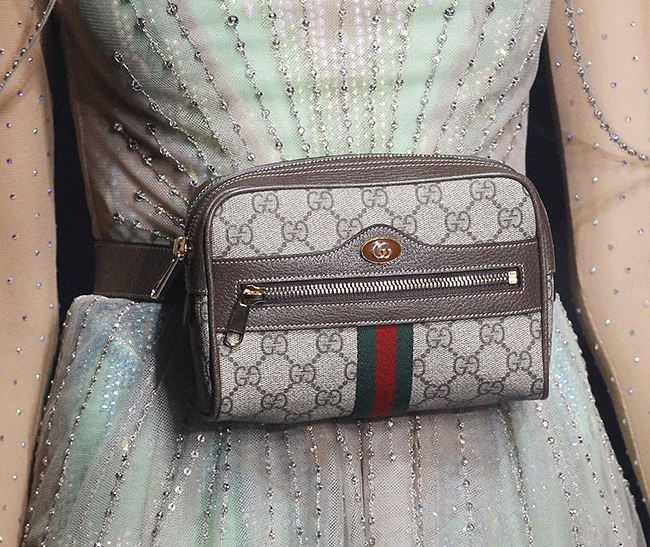 Presented in an Ancient theme runway stage at the Gucci headquarters, the brand presents various bag designs that are truly a work of art for both Men and Women’s Collection. Alesandro Michele’s latest collection features a mix of styles, from vintage to classics and modern. With ruins and Greco-Roman statues, fallen Roman columns, Aztec monuments, and a bandaged mummy peppered throughout Gucci’s Spring/Summer 2018 show venue, the first thought that came to mind was, with all these historical references, could Creative Director Alessandro Michele be going way back in history for the collection? The season’s standouts were a couple of 80-s inspired pieces. One standout was a “fanny pack” style bag complete with all the design finishes of their ever-popular logo bags of the era; the classic taupe logo fabric, the green and red stripe – for those of us of a certain age, all finishes that speak to our luxury-minded 80s selves. For those true collectors who like a little more edge, their questionably-yet-intentionally misspelled “Guccy” cross body bags tap into a visual vibe of an 80s video game while maintaining a very tongue-in-cheek levity that somehow, seems to work despite itself. Naturally, there are those who will find these two offerings derivative and they are undoubtedly right. However, sometimes, it’s just a matter of letting enough time pass to make those of us who are old enough to remember the era the first time around nostalgic for what the design house is offering. Wherever your opinion happens to fall on this one, the buzz that the house is generating with these two styles simply cannot be denied.For the Spring 2018 shows, Gucci has literally saturated the runways with such an abundance of handbags, it’s nothing short of an exhaustive effort to wade-through the offerings to the point of being able to pick a shortlist, let alone a favorite. However, that is not to say that there weren’t a few standouts in what was a seriously eclectic collection.